The White House fired back at Al Gore on Tuesday, accusing the former vice president of hypocrisy for his assertion that President Bush broke the law by eavesdropping on Americans without court approval. "If Al Gore is going to be the voice of the Democrats on national security matters, we welcome it," White House press secretary Scott McClellan said in a swipe at the Democrat, who lost the 2000 election to Mr. Bush only after the Supreme Court intervened. Gore, in a speech Monday, called for an independent investigation of the National Security Agency program that he says broke the law by listening in — without warrants — on Americans suspected of talking with terrorists abroad. 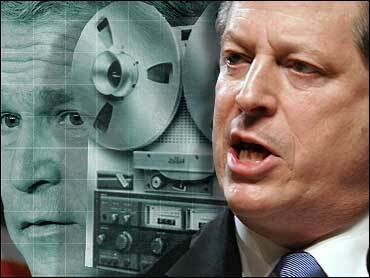 Gore called the program, authorized by President Bush, "a threat to the very structure of our government" and charged that the administration acted without congressional authority and made a "direct assault" on a federal court set up to authorize requests to eavesdrop on Americans. McClellan said the Clinton-Gore administration had engaged in warrantless physical searches, and he cited an FBI search of the home of CIA turncoat Aldrich Ames without permission from a judge. He said Clinton's deputy attorney general, Jamie Gorelick, had testified before Congress that the president had the inherent authority to engage in physical searches without warrants. "I think his hypocrisy knows no bounds," McClellan said of Gore. Meanwhile, two civil liberties groups – the American Civil Liberties Union and the Center for Constitutional Rights – filed federal lawsuits Tuesday seeking to block the administration's eavesdropping program, which they called unconstitutional electronic surveillance of American citizens. In a related development, The New York Times reported Tuesday that the NSA sent the FBI thousands of tips about alleged terrorists in the months after the Sept. 11 attacks. But nearly all the tips, according to current and former officials, failed to pan out or lead to innocent Americans, the Times said. Gore said Attorney General Alberto Gonzales should name a special counsel to investigate the program, saying Gonzales had an "obvious conflict of interest" as a member of the Bush Cabinet as well as the nation's top law enforcement officer. Gonzales, who has agreed to testify publicly at a Senate hearing on the program, defended the surveillance on cable news talk shows Monday night. "This program has been reviewed carefully by lawyers at the Department of Justice and other agencies," Gonzales said on Fox News Channel's "Hannity & Colmes." "We firmly believe that this program is perfectly lawful. The president has the legal authority to authorize these kinds of programs." On CNN's "Larry King Live," Gonzales said Gore's comments were inconsistent with Clinton administration policy. "It's my understanding that during the Clinton administration there was activity regarding physical searches without warrants," Gonzales said. "I can also say it's my understanding that the deputy attorney general testified before Congress that the president does have the inherent authority under the Constitution to engage in physical searches without a warrant. And so, those would certainly seem to be inconsistent with what the former vice president was saying today." Not all Republicans are convinced that the president's policy is justified, reports CBS News senior White House correspondent Bill Plante. The Republican chairman of the Senate Judiciary Committee has already promised an investigation. Gore said there is still much to learn about the domestic surveillance program, but that he already has drawn a conclusion about its legality. "What we do know about this pervasive wiretapping virtually compels the conclusion that the president of the United States has been breaking the law repeatedly and insistently," he said. Mr. Bush has pointed to a congressional resolution passed after the attacks of Sept. 11, 2001, that authorized him to use force in the fight against terrorism as allowing him to order the program. Gore, however, contended that Mr. Bush failed to convince Congress to support a domestic spying program, so he "secretly assumed that power anyway, as if congressional authorization was a useless bother." He said the spying program must be considered along with other administration actions as a constitutional power grab by the president. Gore cited imprisoning American citizens without charges in terrorism cases, mistreatment of prisoners — including torture — and seizure of individuals in foreign countries and delivering them to autocratic regimes "infamous for the cruelty of their techniques." The latest CBS News poll (.pdf) shows the public is split on this, but they are willing, by a margin of more than two-thirds, to allow the government to listen to people it suspects, Plante reports.